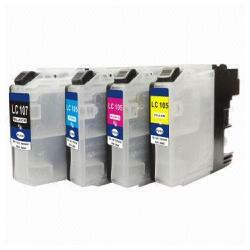 So what is the difference between LC101, LC103, LC105 xxl and LC107xxl brother ink cartridges? How it works is brother in the USA sells all three of the cartridges at different price points, whilst the cartridges generally have the same physical dimensions (lc 105 & lc 107 are larger – only fit a few printers) they contain different amounts of ink. So when they produce the cartridges the LC 101 get filled to one half (starter cartridges that come with a new printer), the LC 103 XL get filled to 100% full. LC101 – capacity is 300 printed pages, only come with the printer you buy not available for purchase (starter cartridges). LC103 XL – capacity is 600 printed pages – This is the best value. We recommend compatible cartridges as you save over 50% compared to Brother original ones whilst getting the same print. If you are in the USA or Canada and looking for a great deal HouseOfInks is recommended click here to buy LC103XL cartridges. They come in the following black (LC103BK), cyan (LC103C), magenta (LC103M) and yellow (LC103Y). These suit the brother printer models: DCP-J152W, MFC-J245, MFC-J285DW, MFC-J4310DW, MFC-J4410DW, MFC-J450DW, MFC-J4510DW, MFC-J4610DW, MFC-J470DW, MFC-J4710DW, MFC-J475DW, MFC-J650DW, MFC-J6520DW, MFC-J6720DW, MFC-J6920DW, MFC-J870DW, MFC-J875DW. LC-105 XXL – capacity is 1200 printed pages and is available in cyan (LC105C), magenta (LC105M) and yellow (LC105Y). LC105 and LC107 are the same cartridges and fit the same printers just brother for some reason only known to them have given the black cartridge a different number code. I recommend HouseOfInks for these cartridges so click here if you want to save over 50% compared to brother original cartridges. The best deal is always the larger capacity cartridge so in this case the 107XL, whilst your printer may not state it is compatible with the lc105-xxl & lc107-xxl we have never heard of one not working as all the cartridges mentioned are nearly identical in size. So if your printer uses LC101 cartridges or LC103 XL cartridges do yourself a favor and buy LC-105XL & LC-107XL cartridges if it’s compatible with these as will save you money as they don’t need to be changed so often and that means less landfill from used cartridges. Save even more money by using compatible ink cartridges? Brother ink cartridges have started using micro chips in almost all new cartridges and printers however as usual the compatible cartridges also have chips that are accepted by the printers so you should have no problems. If you own a bother printer made in 2012 or before you probably use non chipped cartridges (that’s great!) we talk about that in another older article. You can head over to Brothers USA web site to get a list of genuine ink suppliers or if you wish to save even more money choose to use compatible cartridges as the quality is pretty good. Which brother printers use these cartridges? Please look earlier in the article for the model numbers supported so you can check if your printer can use the cartridges listed above. These model numbers are sold in America and a few other regions.